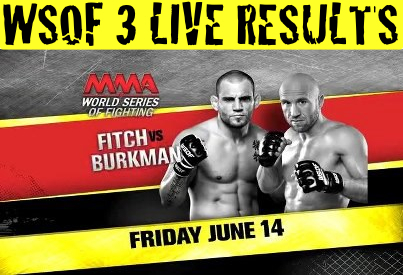 MMA World Series of Fighting returns to the Hard Rock Hotel and Casino in Las Vegas this evening for their third event, “WSOF 3: Fitch vs. Burkman 2“. The pro mixed martial arts event features plenty of well known names and is headlined with a welterweight bout between former UFC top contender Jon Fitch and fellow UFC veteran Josh Burkman. The WSOF 3 main card will air LIVE on NBC Sports Network at 11 p.m. ET / 8 p.m. PT. Preliminary card action will stream live on Sherdog.com starting at 8:30 p.m. ET / 5:30 p.m. PT. ProMMAnow.com will provide LIVE results and play-by-play commentary of the action. Round 1 – Big leg kick inside from Beerbohm. Again. Clinch, knee from Volkmann, another, again, again. Beerbohm turns him around to the cage. Volkmann holds a front headlock. Beerbohm drops levels for a double. Volkmann riding his neck, lands some nice shots to the ribs. Volkmann riding Beerbohm’s back now, takes the back with one hook in. Volkmann looking for the choke, scramble and Beerbohm gets free, scramble to the feet, clinch against the cage. Beerbohm drops levels. Ref separates them. Body shot Beerbohm, he ties Volkmann up against the cage, looking for the takedown but Volkmann defends. Not much to go on here but PMN sees it 10-9 Volkmann. Round 2 – Light body kick from Volkmann. Body shot from Beerbohm. He pushes Volkmann to the cage. Knee to thigh from Beerbohm. Volkmann holding his neck. Volkmann with a leg kick, straight left. Leg kick Beerbohm. He ties up Volkmann again against the cage. Knee to thigh from Beerbohm. Ref wants action. Knees to thigh from Beerbohm. Knee to thigh from Beerbohm, again. Body shots. Ref separates them. Clinch, knee from Volkmann. Beerbohm with a knee to the gut. They trade knees to the body. Beerbohm with a body shot and clinch before the bell. Supremely ugly fight. 10-9 Beerbohm. Round 3 – Right hand from Beerbohm. Brief clinch. Volkmann shoots, gets Beerbohm down, takes his back, they roll, one hook in. Beerbohm scrambles out as Volkmann rides his back, gets both hooks in and now a body triangle. Volkmann looking for the choke. Two minutes to go. Beerbohm trying to twist and turn and get free but is unable to break the body triangle from Volkmann. He is surviving and defending the choke but that’s all. PMN sees it 10-9 and 29-28 for Volkmann. Round 1 – Touch gloves. Steele with various kicks keeping Carl at bay. Leg kick. Carl comes after him with punches. Big leg kick from Steele. Another. Side kick. Leg kick. Carl with a right hand, Steele shoots for the takedown and Steve Carl jumps on his back, locks on a rear naked choke and this fight is over folks, just like that. Round 1 -Fitch gets dropped with a punch. Burkman jumps on a guillotine from half guard and he leaves Jon Fitch in an unconscious heap on the floor. Fitch wakes up a few moments later not knowing what hapened. Absolutely amazing. Fitch leaves the cage obviously embarrassed. He doesn’t even wait around for the official result. Burkman knew the fight was over before the ref, he got up and left Fitch there before the ref even knew what happened. Fitch comes back for the post-fight interview. Says he would be happy to have a rubber match as they’ve both won one via submission.